Arizona’s Canyon Lake, originally uploaded by atridim. Canyon Lake is one of the most beautiful lakes in the world. 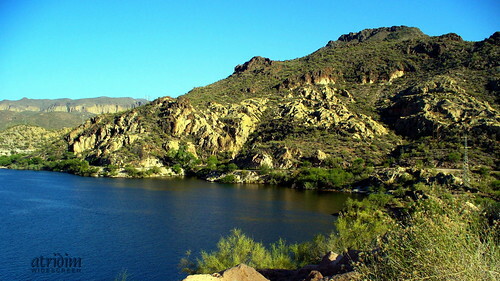 Canyon Lake is one of four reservoirs that were formed by the damming of the Salt River in the U.S. state of Arizona. The lake was formed by the Mormon Flat Dam, which was completed in 1925 after two years of construction. Canyon Lake, with a surface area of 950 acres (380 ha), is the third and smallest of four lakes created along the Salt River. Two others, Apache Lake and Roosevelt Lake are upstream. The fourth, Saguaro Lake, is downstream. Canyon Lake lies approximately 15 miles (24 km) up the Apache Trail from Apache Junction, Arizona and 51 miles (82 km) east of Phoenix. It is within the Superstition Wilderness of Tonto National Forest and is a popular recreation area for the Phoenix metropolitan area. Recreation amenities include hiking trails, camping, and boating, all managed by the United States Forest Service. Canyon Lake is a popular stop on the way to Theodore Roosevelt Dam and Tortilla Flat, Arizona.